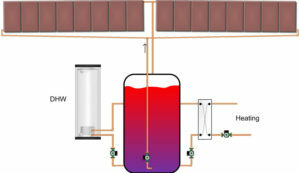 Home &sol; Archive by category "Solar thermal design"
You’ll need a few basic details about your system. Here are some good questions about the correct sizing for an expansion tank from a conscientious installer — which I know includes all of us. 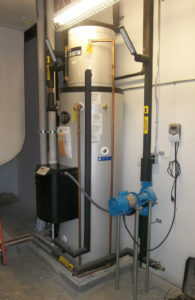 If you can visualize the concept of a correctly installed pressure glycol system, the answers will become more evident. The goal is to not blow off when the power fails on a super-hot day. To do this, the system needs to be designed along the lines of a drain-back system. Sometimes it’s called a steam-back system. This is the only sure way to design this to make it work correctly. Let me explain, and your other questions will start to become clear once you understand how it works. All plumbing coming out of the collector array MUST drop down several feet to form a thermal lock or trap for the steam in the collectors. The liquid/steam must not migrate at all. Water expands 1,130 times when it flashes. If in any way it can migrate and flow out of the collectors, it’s not possible to have a large enough expansion tank. With this understanding, you can now start making the calculations you need. For example, a single 4’x10’ collector, holds 1.3 gallons of water. So, if you have a string of eight 4’x10’ collectors, the total is 10.4 gallons. This should have 1″ pipe (copper handbook). Never oversize the plumbing or you lose control. Most systems have between 20 to 40 psi. Remember, every 100 feet of water has 44.4 psi. Add this to whatever you start with. Oh, and make sure you size the PRV with a good margin above set pressure. The expansion tank should have a cold unloaded pressure set before you start to fill that is close to the psi your system will be set at. You cannot change or check the pressure on an expansion tank after it has been loaded. The reading will be wrong. You might get some other suggestions for setting the pressure. I know Velux and Heliodyne have some interesting guidelines. Then too, I’m not a pro on pressure glycol systems. We do drainback every chance we can. But, European collectors generally can’t do drainback when they have a serpentine riser inside. Good luck — or, do it correctly and you won’t need any luck! 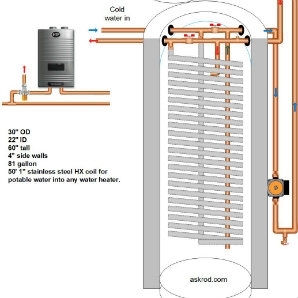 As you get ready to design a solar thermal system for your home, there’s one factor you may not be considering that could make a bucket load of difference: What’s the beginning temperature of the water you’ll be heating? In the United States’ northern climes, it’s likely 50°. In warmer, more southern climates, you’re likely beginning with 70° water. And common sense tells us, the colder the water you start with, the more solar uumph you’ll need. I’m asked all the time how to design a residential system. And, as I worked on the attached chart, I realized it pretty much tells you the basics of what you need to know – the size of the storage tank and the number of collectors. This attached chart will give you an idea of what to expect. The chart allows you to determine if, for instance, you’ll be heating an 80-gallon tank in a system sized for up to three people, or a 119-gallon tank sized to serve three to five people. I chose these sizes because they are averages for family-sized systems. These numbers can be easily customized. So, to read the chart: Say you’ve decided on an 80-gallon tank and you live in a colder area, then you’d chose line 1. And, reading across, it will tell you the number of solar collectors you’d need based on the sizes of the collectors you’d like. Continuing this example, you decide that your home in Michigan has a large roof area and you’d like the largest collector — the 4’x10’ collector. Based on this chart you’d need two of those large collectors — or 80 square feet of collector real estate — to heat that 80-gallon storage tank. As someone who lives in a northern climate, I shake my head sometimes knowing that we colder people all need a little extra uumph. But I know that we snow people – I live in northern Utah — will enjoy our hot water all the more. Just as a side note, the input water temperature also has a bearing on how steep should you tip your collectors, believe it or not. If you live in 70 degree, you’ll living in a 30 to 40° latitude, so you’d use a tilt or angle of 30 to 40° for optimal performance. Likewise, those in the colder climes with colder water probably live in a 40 to50° latitude, therefore using a 40 to 50° tilt or angle. To download an Excel file of the chart, click here. 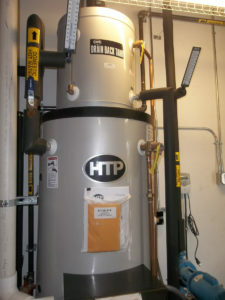 I’m asked, more and more, to provide a solar hot water system design for light commercial systems. There is, indeed, an effective and simple design template for smaller commercial systems that need to heat up to 330 gallons of water per hour or less. The actual system this template is based on is for a fire station; the solar is designed to cover 80% to 100% of the load in a southern climate. However, this category of light commercial could also include restaurants and cafes, hair salons and spas, grocery stores, laundromats and car washes. Some of these businesses may require even larger systems, which we’ll discuss in an upcoming blog post. Why am I recommending this template? Because it’s the most efficient in its design, and it offers greatest simplicity in installation. It has freeze and overheat protection. Also, it requires little or no maintenance. 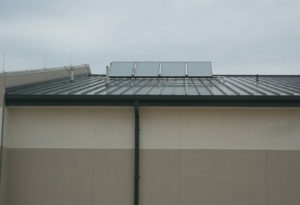 The virtue of this system is that solar directly heats the water to be used. 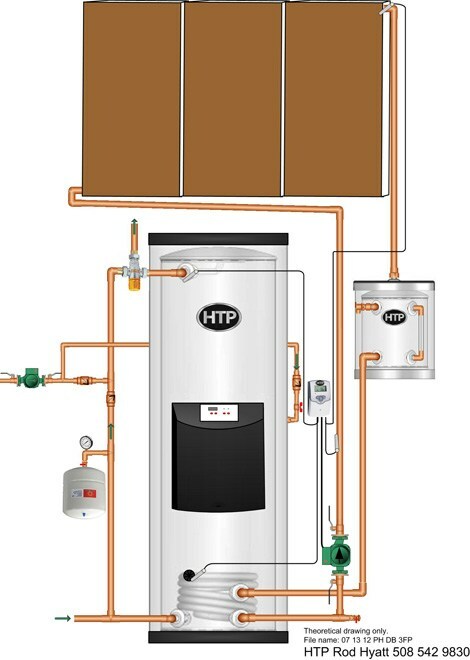 Too often I’m sent designs that preheat water for some conventional water heater that can’t be heated with the solar directly. This template includes three 4’x8′ flat-plate solar collectors. The number of panels may be adjusted according to the climate of the location. On that fire station I mentioned, because it’s in Texas, a hotter climate, fewer panels are required. If I were to spec out a similar system for a northern location, I’d possibly use one more panel or use larger panels. This system also allows data logging with web monitoring so that its performance can be checked at any time online. The photos below show a system using this design at Corry Station Bldg 3782 (a GSB support building) at Florida’s Eglin Air Base. The contractor is McDonald Construction of Fort Walton Beach, Fla., and they really know what they are doing (850-862-2151). The engineer was Jimmie Johnson of Johnson-Peaden Engineers, also in Fort Walton Beach. Manufacturers’ rep is Coleman-Russell. For installation instructions, you’ll need to download “Control Instructions” HERE. The last page of the manual should be followed for a correct installation of the drainback configuration. You will also find the programming instructions for this system on page 4 of the Control Instructions.